Opening Friday, February 2 in the Spotlight gallery is a selection of new works by Heights Arts founding board member and ceramist Sharon Grossman. While she is best known for her vessels, for this installation she produced a suite of pieces that are all meant to be wall-hung. 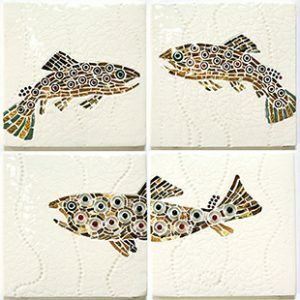 Many of the works employ the technique known as pique assiette that uses broken shards of dinnerware the create mosaic designs. In a previous creative life, Grossman was a woodworker and furniture maker, and that background informs her approach to ceramics. “I have always loved carving,” she says,” and a lot of my work includes carved or inlaid elements. To me, this body of work really combines those interests that led me first to make furniture and then to take up ceramics.” The spotlight gallery offers opportunities for artist-members of Heights Arts to present concise, one-person exhibitions that complement larger group shows in the main gallery and offer more of an in-depth look at a single artist than can be presented in the gallery shop.